Among the personal microdermabrasion machines in the Zeny catalogue, the Zeny 108 is the lightest, which has a gross weight of 2.5 kg. This Zeny 3-in-1 diamond microdermabrasion review spills the beans about this portable microderm machine. It is one of the most popular names when it comes to at-home exfoliation devices. But is it good enough? 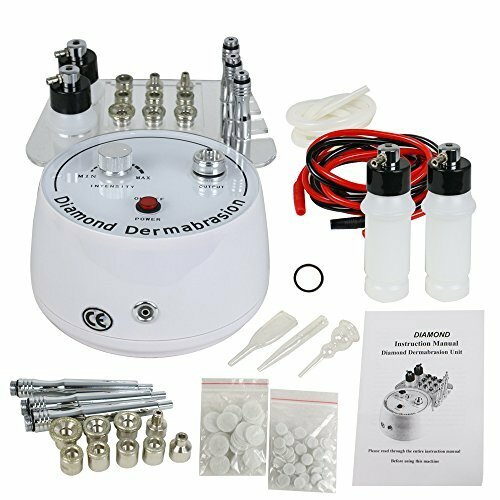 This Zeny 3-in-1 diamond microdermabrasion review includes a brief introduction about this machine, a video on how to set it up, a Zeny vs Kendal comparison chart, a report on consumer feedback, and a chart of similar-looking products. What can you expect with the Zeny 3-in-1 diamond microdermabrasion machine? First, it’s not called a “3-in-1” device for nothing. Its 3 functions include the following: (1) microdermabrasion machine to scrub off dead skin cells; (2) vacuum therapy machine to clean dirty pores and increase blood circulation; (3) spray function to spray a refreshing mist after treatment, which is also helpful in closing pores. When you unbox your package, you should receive the following parts and accessories: the microderm machine, a PVC vacuum hose, 3 aluminum wands, 9 diamond tips, 2 packs of cotton filters, 3 ventouses, 2 spray bottles, a connector, tube rings, fuses, and a manual. What is the suction power of the Zeny 3-in-1 microdermabrasion machine? If you take a look at the intensity dial, there is no gauge to objectively tell you how much suction you set the machine at. 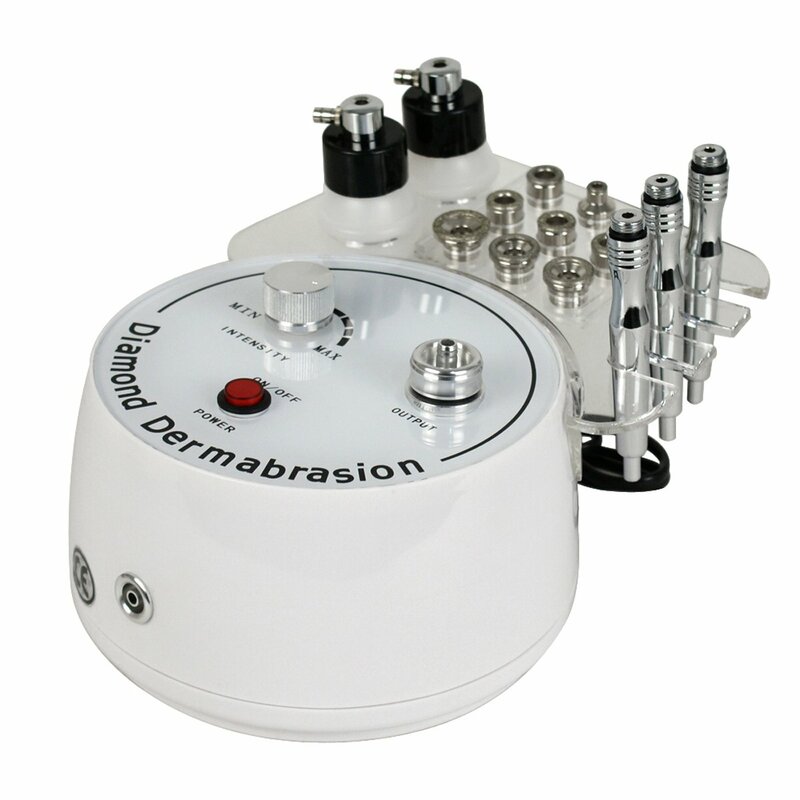 But according to the sellers, this home microdermabrasion machine has a suction range of 0 – 55 cmHg. This video explains how to set up the Zeny 3-in-1 machine. It shows you the parts that go with the inlets of the device. Unfortunately, the Zeny 3-in-1 diamond microdermabrasion machine is not something we’d call… unique. At first glance, it looks similar with the Kendal BM02, which is another 3-in-1 machine. Here is a chart detailing their similarities and differences. As you can see, the accessories are pretty much the same, but their difference lies in the number of wands, their gross weight, and the number of cotton filters included. To begin this Zeny 3-in-1 diamond microdermabrasion review, let’s start with a disadvantage. First, the Zeny 3-in-1 diamond microdermabrasion machine needs clearer and more comprehensive instructions. As mentioned by many buyers, the included manual is very basic, which can make it quite difficult for beginners to set it up and get it going. Some people tried to get around this by relying on Youtube videos, but had it come with a well-written manual, consumers should have been spared of this effort. Here’s another negative feedback – this machine doesn’t have enough suction. This can be substantiated by the fact that the suction can only go up to 55 cmHg. Note that in comparison, other machines can go up to 76 cmHg. Now, let’s talk about the performance of the machine. To several users who achieved positie results, this machine has helped them to reduce their stretch marks, improve their complexion, and fade their dark spots. Not everyone has a positive experience, though.